We have two kinds of potato washing and peeling machines: the vertical one and the horizontal one. 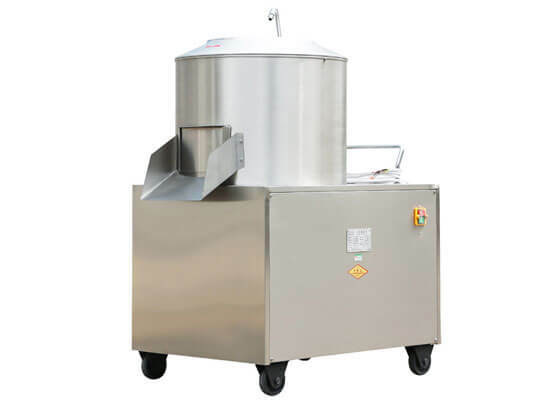 This potato washing and peeling machine is mainly used to clean and remove the peel of potatoes, sweet potatoes, taros, lotus root, carrots, mustards, yam, turnip, and some other root vegetables & fruits, which is an indispensable washing and cleaning machine for the restaurants, hotels, and some other vegetable or food processing industries, and also it can be a necessary equipment of a potato chips production plant. 1. It mainly consists of motor, reducer, lifting device, multi-edge peeling rollers, rinsing tank etc. 4. Rollers are made of nylon rope, a light material which is very durable. 5. Separated dirt and sediment are removed with the circulation of water. Firstly, the lifting device delivers the potatoes to the rinsing tank. Then the cleaning and peeling devices begin to wash and peel the skin off the potatoes continuously. In the end, the thruster pushes the peeled potatoes to the prepared potato container. 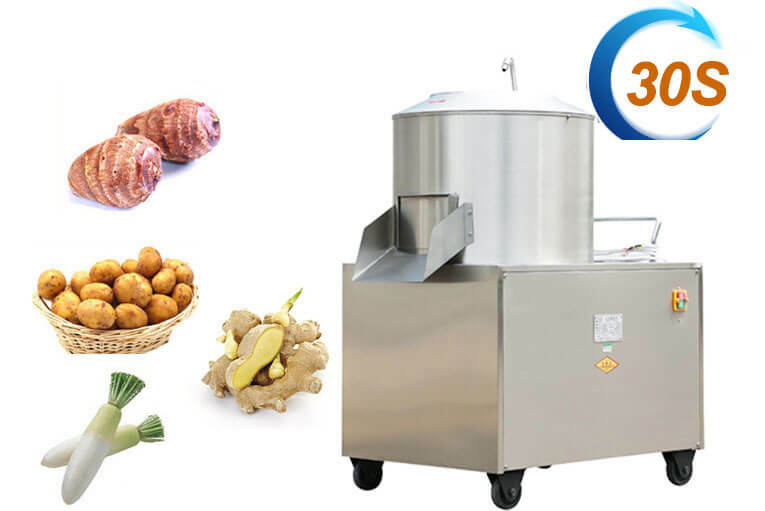 This potato cleaning and peeling machine can process various root vegetables and fruits, such as potato, sweet potato, carrot, mustard, yam, beet, and ginger, etc. 1. High rinsing and peeling ratio, and quality processing result with no damage to the product. 2. The machine is made of high-quality stainless steel, and its rollers are made of wear-resistant nylon, which means a sanitary process and a long service life. 3. There is a circulation of water to remove the separated sediment after washing and peeling. This machine is composed of a motor, speed controller, 8-12 rollers and rinsing tank. The motor drives the roller to roll the fruit and vegetable to complete cleaning and peeling with the help of water circulation, and the water circulation removes the separated sediment.